EE, which is a collaboration between Orange and T-Mobile is the UK’s first 4G LTE network, the service launches on the 30th of October and now EE has announced its tariff’s for devices on its 4G network in the UK. EE’s tariff prices start at £36 a month, this is for a 24 month contract and for this you get 500MB of data and WiFi, plus unlimited calls and texts, the top plan will set you back £56 a month and this gives you 8GB of data and unlimited calls an texts. 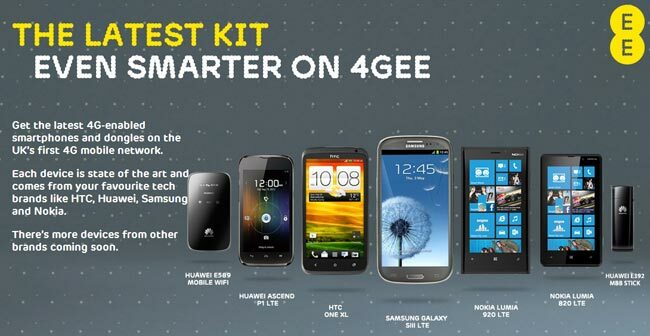 There will be a number of 4G LTE handsets available with EE when it launches on the 30th of October, which include Apple’s iPhone 5, the HTC One XL 4G LTE, the Samsung Galaxy Note 2 4G LTE, The Huawei Ascend P1 4G LTE and the Samsung Galaxy S3 4G LTE.